It's easy and cheap to create this sensory experience for pre school children and you'll be surprised by how long it will keep them occupied. 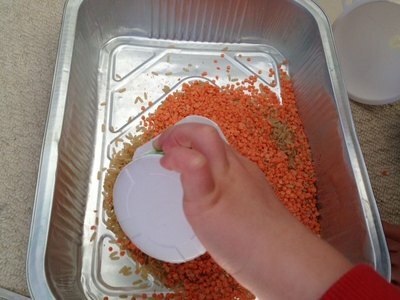 Scooping, moving and picking up the lentils will also help develop fine motor skills. 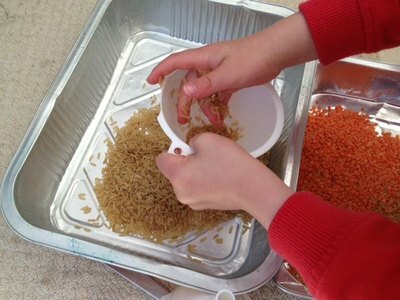 We've used dried lentils and rice in this activity but you could also experiment with dried pasta, beans or other small dry items. If very young children are involved, remember to keep a close eye on them all the time to make sure they don't eat or try to swallow the small items. 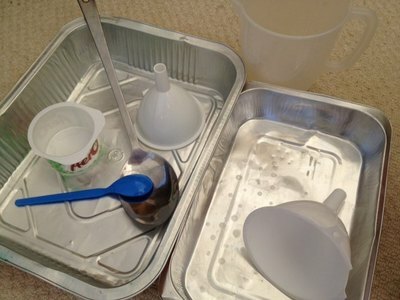 Funnel, pot, spoons of different sizes and any interesting containers or items you find in the kitchen. Fill one tray with lentils. Fill a second tray with rice. 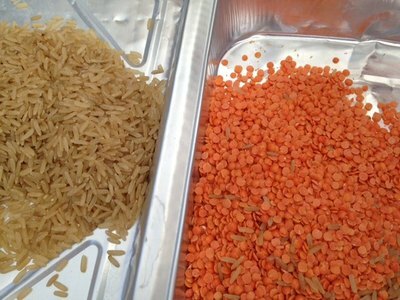 Let your child experiment in any way they like with the rice and lentils. Talk about how it feels as they run their fingers through it. Encourage them to scoop with spoons and transfer between trays and pots. 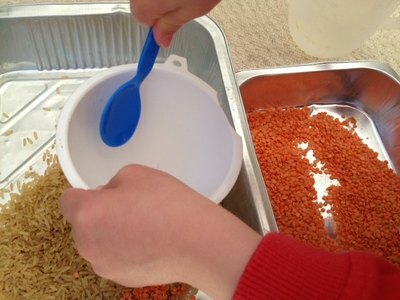 The funnels proved to be the most popular, filling them up and watching the rice and lentils pour through. What does it sound like when you pour the lentils and rice from a pot to a tray? Do you cut your kid's hair? Rock salt being various shapes could be alternative to pulses and grains . For the 5 /7 year olds why not try coloured Jelly Crystals may try try to use Lemon strawberry blending mixing the dried crystals together creating colour change. On warm days doing the same activity for the 5/7 year olds who can add small amounts of cold water Creating from mass to liquid do this outdoors .must be well supervised .